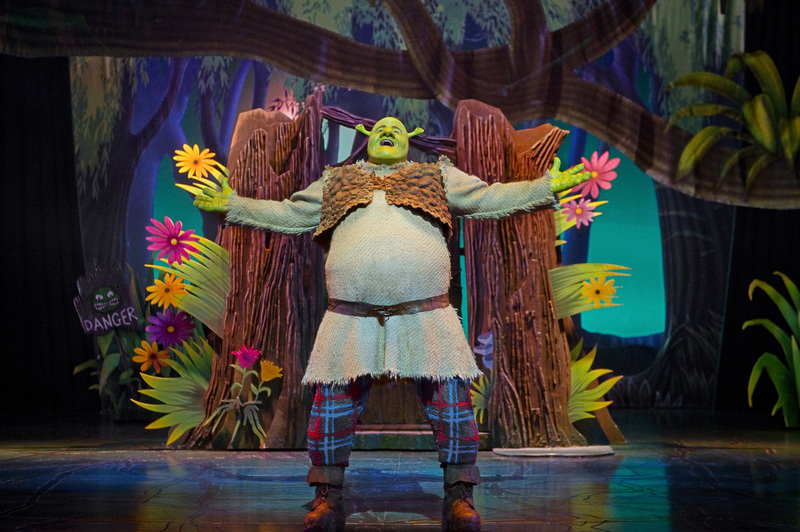 Shrek The Musical is back at Milton Keynes! Based on the award-winning DreamWorks animation film, Shrek The Musical is this year’s must-see show for all the family – and when we say ‘must-see’ you really MUST see it! Let’s face it, Shrek is an unlikely looking hero but with his loyal (if hugely irritating) steed Donkey, he embarks on a quest to rescue the beautiful (if a little temperamental) Princess Fiona from a fire-breathing, love-sick dragon. Add the diminutive Lord Farquaad and a gang of fairytale misfits, and you’ve got an all-singing, all-dancing, all-gloriously funny spectacular GIANT of a hit show! 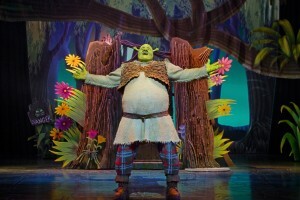 The company stars Steffan Harri as the swamp-dwelling Shrek, the role he previously played in the West End. Laura Main is damsel in distress Princess Fiona. Bedfordshire’s Marcus Ayton is Shrek’s wisecracking sidekick Donkey and Samuel Holmes is pint-sized villain Lord Farquaad. Nigel Harman (well-known, well-loved and consistently well out of order playing a series of bad boys in Eastenders, Downton Abbey and the Sky Living series, Mount Pleasant) has directed the tour. 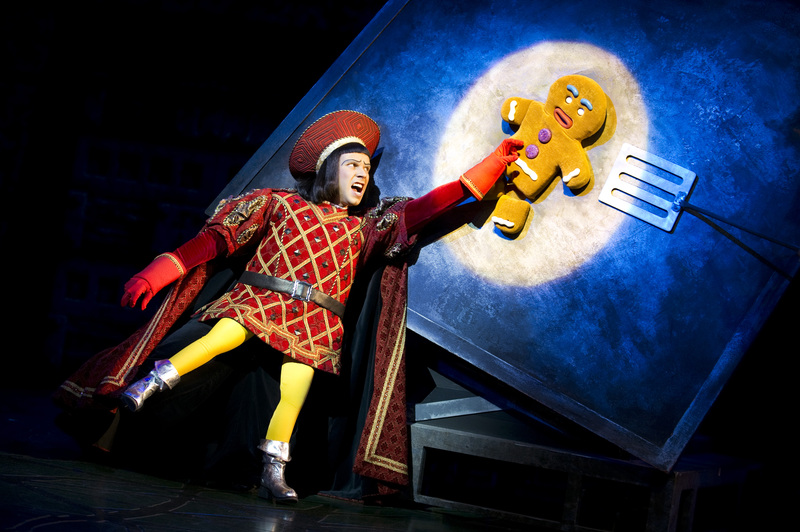 Having played Lord Farquaad in the West End, Nigel came to the role of director knowing exactly how entertaining the show is for both adults and children and determined to make it even more of a monster of a hit. And when you’ve got a full line-up of fairy-tale characters at your disposal, how can you not have fun? So, would you please give a big welcome to the Three Little Pigs, Pinocchio, Three Blind Mice (in stockings and carrying white sticks) some tap dancing rats, a large, low flying dragon, a tortured gingerbread man and, of course, a cross-dressing wolf! Featuring a great score of all new songs as well as cult Shrek anthem I’m a Believer, Shrek The Musical is making Milton Keynes Theatre the biggest, brightest, most beautiful place to be this summer! Even if the cast hadn’t been 1st class (They are, they’re great!) I would tell you to get to see Shrek the Musical at Milton Keynes Theatre purely for the design and production values alone! From the utterly brilliant costumes to the sets, the special effects (including a wonderful singing dragon) to the direction by Nigel Harman. Those things alone would make a fabulous night out for all the family. 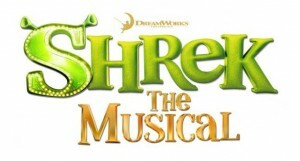 Don’t run away with the idea that this is just a show for children, I guarantee the adults of the family will laugh a lot, have sympathy for Shrek and enjoy the excellent 7 piece orchestra lead by Colm O’Regan. I probably shouldn’t single out anyone from this talented cast, they were all just perfect, but from the moment Steffan Harri (Shrek) opens the show he’s got the audience in the palm of his hand, he’s no mean singer either. Marcus Ayton (Donkey) and Laura main (Princess Fiona) both prove that in addition to fine singing talents they both have a flair for comedy. Speaking of comedy, Samuel Holmes as Lord Farquaad absolutely tears the house down with some brilliantly funny scenes! I’m now a devoted fan of his horse “Fibreglass” – the only horse I’ve seen with a reverse gear! 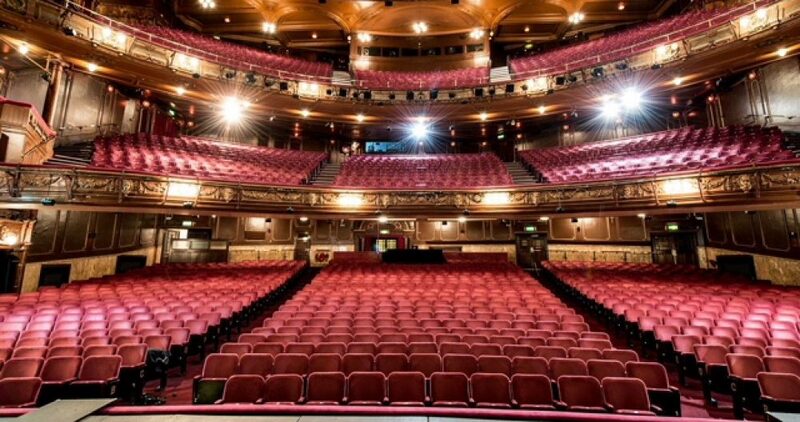 You might not leave the theatre singing any of the tunes – apart from I’m A Believer the Monkey’s old hit, which like in the film is used for the end credits, but you will most certainly come out with a smile on your face having had a truly magnificent theatrical experience!